"Being a person who truly enjoys my morning coffee, I was skeptical, to say the least, about attempting to get that same pick-me-up somewhere else. After trying this product and seeing its versatility, I recommend everyone to give it a try." ​The review below is from one of our earliest customers... back in 2013! A very interesting thing happened recently. We received a big order along with a revelation. It turns out that there is another benefit to CaffeinAll™ even we didn’t know about previously: It does not cause any allergic reaction in people who are sensitive to caffeine. And that includes caffeine from natural sources! We are, of course, very grateful to her to tell us about this unique feature - and how much our product means to her. She certainly made our day - so can CaffeinAll™ make yours. Delectably Energizing. They All Say So! Our take is that caffeine - like everything else - is beneficial for you IN MODERATION. Consumer Reports, the highly regarded independent non-profit magazine, has a very simple quiz on their web site. It allows you to figure out how much you know about your favorite stimulant. Read more about it or take the quiz now. “When I was an evening/part time university student, I had a love-hate relationship with caffeine. It kept me awake through the evening lectures most of the time….” Read more about it now. Myth: Although caffeine is considered a mild stimulant, it’s not addictive, according to the American Journal of Drug and Alcohol Abuse. Unlike classic stimulants – think cocaine and amphetamines – there’s rarely a strong compulsion to use caffeine. Read the article now. When people imbibe drinks with caffeine and alcohol at the same time they can develop an over-inflated impression of their capabilities and are more likely to engage in risk-taking behavior… Read more about it now. Caffeine Zone is a free iOS app that tells you the perfect time to take a coffee break to maintain an optimal amount of caffeine in your blood. It also tells you when to stop drinking tea and coffee, so that caffeine doesn’t interrupt your sleep. Highly recommended - read more about it now. What Is the Most Caffeine You Can Handle? It’s an excellent tool. And Ted’s website is a treasure trove of useful information. 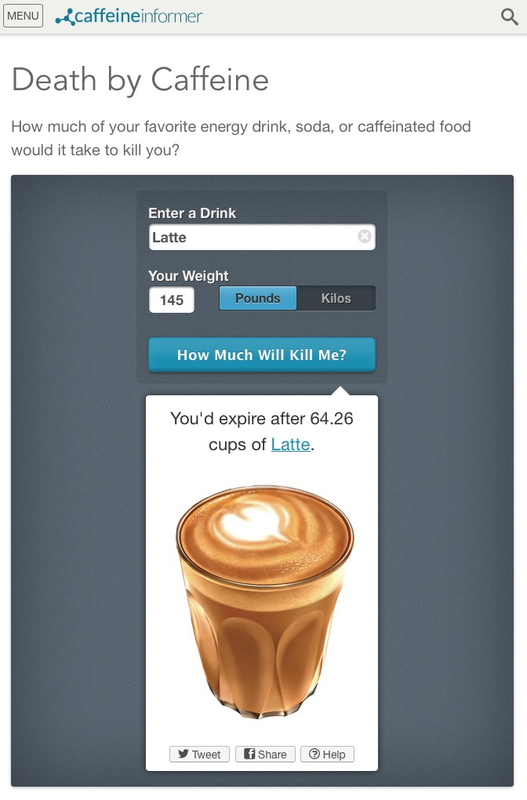 Use both and there will be no “Death by Caffeine” anymore. "I love all forms of energy drinks, the problem is the extra liquid has me hitting the bathroom frequently... I'm on the road a lot so this has been an issue. Coffee, tea or any of that stuff is just more liquid. Anyway, I found this product and it has proved to be what I was looking for. Some quick sprinkles on whatever food I'm eating or snacking on and I'm good with just the normal 8 oz of water. I used to drink coffee or tea for the caffeine so now I can eat normally with a glass or bottle of water. Plus those energy drinks and shots have sugar and are loaded with who knows what! This stuff is quick, simple and it works." "I always feel like I am dragging myself through the day even after drinking many cups of coffee. I tried all the energy drinks and find them to just make me sick and most are full of sugar. A friend of mine and his coworkers who work nights use this product. They told me that it works better than anything else and they use it on their food before and during work and are able to feel energized all night and no longer feel like they are going to fall asleep while on their feet at work. So I ordered some to give it a try. I have got to say, this product really surprised me. I never thought of being able to shake caffeine on my food and get more energy this way. I have been using this product for a couple of weeks and love it. I no longer drag myself around and I don’t have to drink coffee anymore which used to irritate my tummy. I shake this on my breakfast and it gets me up and going all day and if I begin to fall flat, I just sprinkle a little on my food and I am off and going. What I really like is that I don’t feel jittery or anxious like coffee makes me and when it’s over I don’t feel like I just got dropped. It is just like I am now relaxed and usually I don’t need it at night so I only have to use it in the morning to keep me going all day. No longer am I tired after lunch or between 2-3pm when I feel like I have to take a nap. I really like this product and I can’t really tell it’s on my food. I would have thought it would have been bitter like coffee can be but it isn’t. I would recommend this to anyone wanting to find a way to stay energized without feeling anxious and jittery. I also have saved a lot of money that I would have spent out on coffee especially when on the way to work or during lunch." "This is very effective. Just remember to stop taking it about 6 hours before bedtime. Cheaper than energy drinks loaded with sugar. Easier on my tummy than coffee and it doesn't stain my teeth like colas." "Thank you very much for sending the goods! I tried CaffeinAll and it really works for me now, once I figured out how much to take." is non-bitter caffeine, created by our food scientists to give you a healthy boost* any time you need it. * Use it at your own risk over 300 mg a day!